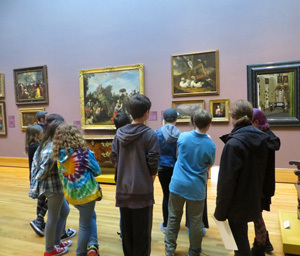 A school group enjoys a tour at the Bowdoin College Museum of Art. The Bowdoin College Museum of Art offers interactive educational tours for a wide audience, ranging from pre-schoolers through adult groups. Through tours and activities, the Museum aims to provide an environment that stimulates curiosity, creativity, and critical thinking through the interdisciplinary study of works of art and culture. The Bowdoin College Museum of Art welcomes and encourages groups of all sizes and interests to visit. Docent-guided tours are available at no charge Tuesday through Friday from 10:00 am to 4:00 pm and last approximately one hour. Please book tours at least 3 weeks in advance. Self-guided tours are also welcome any time the Museum is open, though we appreciate knowing about big groups in advance of your visit. To book a tour today, please complete the tour form. If you have any special requests or questions, please note them in the “Special requests or questions” section of the tour form, and a Museum staff member will get back to you. The Bowdoin College Museum of Art is excited to announce that it has limited funds to underwrite transportation for school groups, after school programs, and student organizations whose access to resources might limit their ability to visit the Museum. Applications will be accepted on a rolling basis for the 2017-2018 academic year, beginning in September 2017. Please complete this application form and return it to Honor Wilkinson. If you have any questions about the application process, please contact Honor Wilkinson, hwilkins@bowdoin.edu or call (207) 721-5098.